I believe we are entering a golden Knowledge Age that will disrupt the power structures that have retarded human development. @anonymint defines knowledge here: Information is Alive! You will probably need a week or two of studying the thread slowly. I will be the first to admit I needed a week to fully absorb the following works of AnonyMint. Together these are quite simply the most insightful piece of economic theory I have ever read. And I am finally ready to write the sequel to the companion blog, The Universe, and more closely relate information to our tangible world described by physics. But I don't have time to write it formally with lots of equations. So I am going to write only the rough sketch now and refer to the equations and symbols in the prior blog. I want to focus first on Verlinde's derivation of the gravitation force from emergent principles of conservation-of-energy and Shannon entropy (upper bound of the information content) which I had explained in the prior blog. First of all, I want to explain why the Second Law of Thermodynamics dictates that energy must always disperse from a hot to a cold body, and not the reverse of a colder body giving up energy becoming colder and making the hot body hotter. This is because the equation for entropy of any system is maximized by having as many equiprobable possible states, i.e. the probability is very high that a hot body with its very highly probable collision of moving particles due to high kinetic energy will transfer some kinetic energy to the slower moving particles in the cold body because it maximizes the entropy of the combined system of hot and cold bodies together. But that is sort of a tautology. The point is that random events are unlikely to be able to keep a system highly ordered and concentrated, just as random twists on a Rubik's cube are unlikely to solve it. Since there can't exist any top-down omniscience in the universe, the probability of maintaining ordered systems trends towards zero on a large enough scale. This is why one can keep small things in order for a while, but large endeavors unravel more quickly. For the same reason, small things grow faster, such as a saplings grow to trees, but trees don't grow to the moon. Referring to the equations in my prior blog, Einstein related the mass of an object to the potential energy it represents at the speed-of-light squared (E=mc²). So we can substitute energy for mass, or vice versa. And the energy that a colder body absorbs is related to the number of equiprobable possible microstates N it has and the temperature T it achieves. So the larger mass M is dispersing energy to the small mass m (via electromagnetic transfer, e.g. photons) exerting a gravitational force due to this probability to transfer energy. 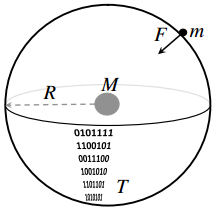 The number of microstates is dictated by the surface are of the imaginary sphere at the radius R which separates the two masses, because the photons only have two degrees-of-freedom, azimuth and altitude, to travel from mass M to mass m, corresponding to two orthogonal circles of radius R. Thus the surface area of the imaginary sphere (based on the square of the two degrees of freedom each with a range of R) and not the volume inside it, determines the possibilities for states that mass m could possibly be in. When we put all those equations together, magically the correct equation for the gravitational force is achieved, although that equation was originally derived from Newton's laws which have no concept of entropy or microstates of the bodies in consideration. Verlinde's discovery was a major revelation for Physics. What I want to add is the insight that gravity emerges from the probability that the microstates of relative bodies of mass can't avoid dispersing some energy from the one with the higher energy (mass) to the one with less. As the bodies move closer to each other, the equations dictate the force increases, and this is because the number of equiprobably microstates is decreasing as the surface area of the imaginary sphere decreases, so relative acceleration between the two bodies must increase so as to maintain the rate of energy dispersion. Or in other words, as the bodies move closer to each other, the change in the relative entropies decreases, so the acceleration (and force) increase to compensate since the relative energy (mass) has not changed. 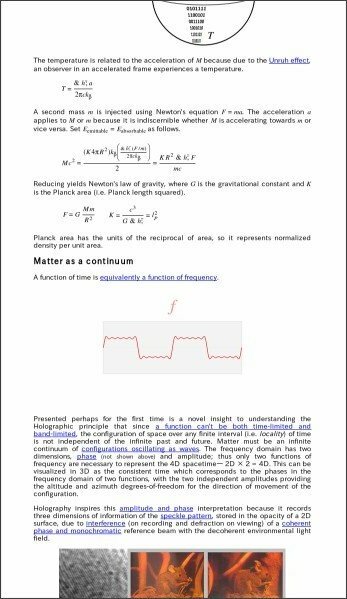 So the upper bound for information content (Shannon entropy) of that system of two relative bodies is directly involved in physics of the acceleration of relative bodies due to the gravitational force. So intangible information content which is a dimensionless quantity, is projected into a dimensional structure in the physical world and thus interacts with energy and forces. This is profound because it seems to hint that information content is not orthogonal to our physical world. Although we can copy information at near zero physical cost, the mere existence of copies of information does not increase the entropy (nor information) of the system. For existing information to create new knowledge or do anything useful, it must interact with the physical world causing probabilities to disperse. Referring back to my Information is Alive! blog, the entropy of knowledge creation increases the more randomized, autonomous (because randomized requires independence) actors of knowledge creation exist. So as our means of interacting to disperse information into more randomized, independent actors becomes more efficient requiring less energy (mass) per unit of information dispersal (synonymous with creation), our reality will more and more be dictated by cost of information transfer than effects of large mass such as moving our bodies around. Tying this back into my essay on the Rise of Knowledge and Demise of Finance, I see humanity moving away from top-down control dictated by the power-law distribution of physical resources and stored monetary capital, and towards a more dispersed spread of information experts. It appears that Agricultural and Industrial Ages were actually just temporary orders that will now succumb to the Second Law of Thermodynamics and usher in a golden Knowledge Age. If you want to read more, please do click this link for past discussion which included critique of Rifkin's Zero Marginal Cost Society. I'm not certain why this is necessarily going to be a golden age. Eventually, the top will not be able to control who gets what information. Eventually, just about anyone will have the technology and information available to them to do something utterly destructive to life (Either intentionally or by grave error.). I think humanity will soon become another example of why we don't see aliens visiting us everyday. I firmly believe that any intelligent species will destroy itself before they are able to start dispersing themselves throughout the galaxy. Millenials have used the explosion of information to post 500 pics of themselves on Facebook and send 500 retarded texts to each other daily. These are self-absorbed zombies that seem unaware of history pre-Internet. Their grandparents, the "Great Generation", lived through WW II, Hitler, Stalin, Mao, nuclear war. The millenials have learned none of these lessons (they equate Ben Bernanke with Hitler and concoct absurd 9/11 conspiracy theories). And so these preening ponces will be forced to confront evil far worse as the 21st century unfolds when the dirty bombs and mutant viruses come for them. The Western Millenials are a small percentage of the world's youth. The developing world "Millenials" are much more realistic and productive. 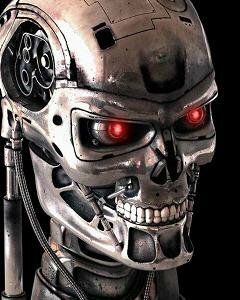 The latest crop of youth in the developing world will be more spoiled, but that is another generation away in the future when I am dead. I think you could say that availability of greater numbers of copies of information increases the chances of its' application, and information dispersal is a critical part of the entrepreneurial process. Entrepreneurship is the practical application of new information about causal chains to transform a system from a lower to higher state of order, lead into gold, to use the alchemical metaphor. The opposite of entropy, and a steadily increasing efficiency of use of energy. I have a model of energy and matter that is based on a primary principle that space itself is expanding at the speed of light. Gravity is caused by a massive cloud of invisible electrons with a pattern of radial anisotropy around matter, which has otherwise a zero net effect because it is almost completely entropic, except that small degree of anisotropy that causes multiple bodies of matter to be pushed together. It seems 'weak' but in fact that is only because its structure is so diffuse. The electron fog, as I call it, in fact is what keeps matter from flying apart at the speed of light. Most of that energy can only be released through chemical reactions that cause the release of infrared photons (heat), but what actually causes the force is the highly disordered electrons during the reaction. If you know anything about physics, you know that magnetism is the primary conduit of energy. There is no known means of applying available energy to the production of physical motion more efficient, it is nearly 100%. If you can generate the super-high frequency, disordered electron patterning in space around you, you can cause motion at the minimum possible cost. Conversely, if you can capture the anisotropy and focus it so that it becomes fluctuating magnetic torque, instead of contra-expansion radial convergence, you can then turn that anisotropy directly into energy.